Asclepius Health™ is a healthcare transformation organisation, focused on the reform of health systems to provide quality, efficient, cost-controlled medical services. As an organisation at the forefront of innovation in Medical System Transformation and Mental Health programs, Asclepius Health™ drives a unique approach to leadership and preventative care programs in the health sector. The Asclepius Health™ Integrated Governance System offers a new and effective healthcare and leadership program which aligns targeted cost savings, patient care and incremental organisational change strategies. New… Asclepius Health™ introduces the Player Well-being Program, based on our Risk Stratification Key (AsclepiusRSK) methodology, offering a unique and highly effective clinical assessment tool to identify and create individual mind health programs for sporting professionals. 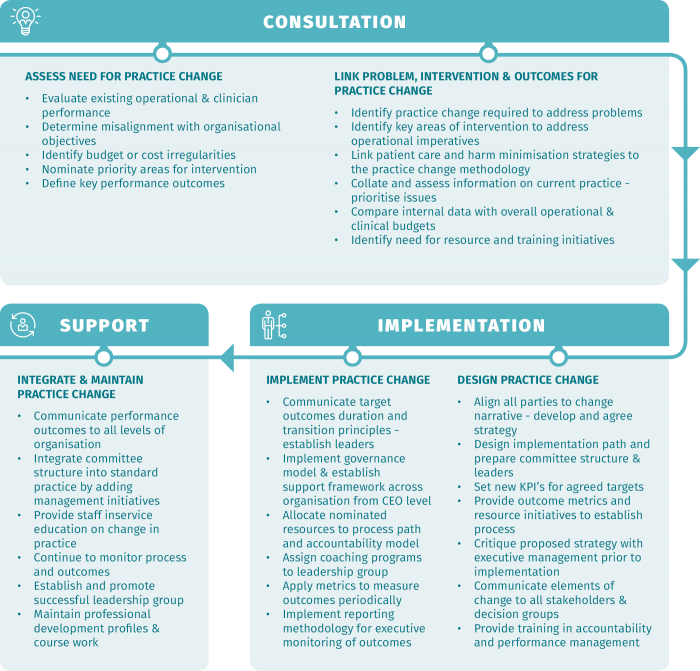 We have adopted traditional evidence based process maps, to generate an effective approach to targeted cost savings, aligned to patient care and harm minimisation strategies. We believe our ‘process’ is a leader in the Industry simply because it aligns operational and clinical outcomes through contemporary work place systems. Assess needs for practice change. Design and implement practice change. Integrate & maintain practice change.